1. The torso should be facing the target with the majority of the weight on the front leg. 2. The back foot should be positioned on the tip toe. 3. The upper torso should be "tall" and positioned over the front leg. 4. The club will be behind you and fairly level to the ground. When a golfer is struggling to stay in balance at the finish, the majority of the time the culprit is "hanging" back on the rear foot and failing to rotate the body properly from downswing, through impact and into the finish. 1. Note how my body is falling away from the target and my head is over my right foot. 2. My right foot is still flat on the ground after impact. 3. The club face is facing the sky. 4. My chest is facing to the right of the target. Following is a great drill which will help you begin to make the correct move from back swing to finish. 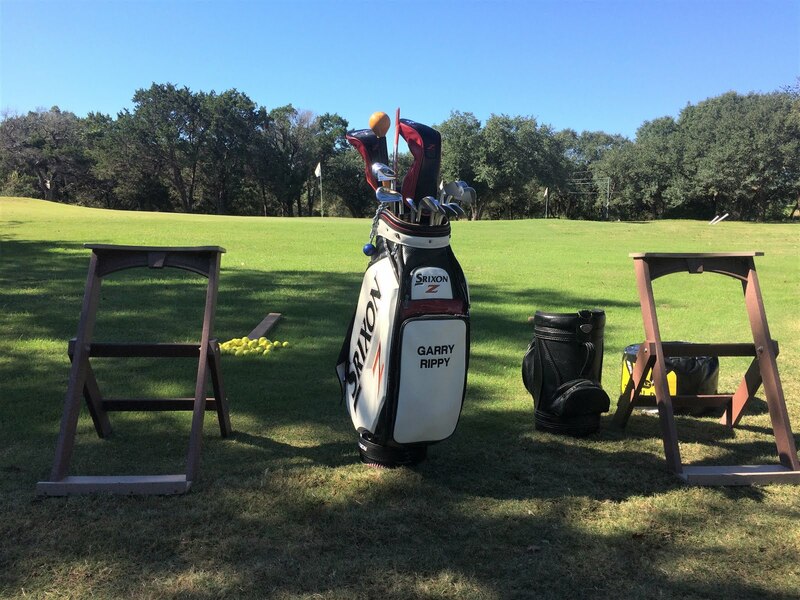 To Begin- I recommend using an 8 or 9 iron for this drill. 1. You will need 3 alignment rods or use 3 clubs. 2. Place two of the rods in line with each other leaving about a 6" gap between them. These two rods are on your toe line. 3. Place a third rod parallel and about 8" from the front rod (rod closest to the target). Set Up- Take your normal set up with your toes either touching or parallel to the rear alignment rod. 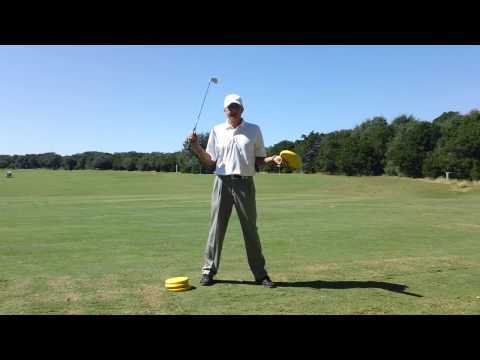 Back swing- Your back swing should be about waist high with little or no wrist hinge. Note how quiet my lower body is. There should not be excessive hip or knee movement on this abbreviated back swing. Impact- At impact, the club and lead arm are in alignment (no scooping or trying to make the ball go into the air). Note how my hips are rotating "open" or toward the target and my back heel is releasing from the ground. Finish- The goal at the finish is to get your club to stop between the two rods in the front of your stance. The club will be pointing toward the target if performed correctly. In addition, the toe of the club is pointing upward. Since this is not a full swing, you will not finish with the club behind you. We are just trying to get you to a certain point in the follow through which will ensure you will be able to continue to the proper full finish. Note how "tall" my torso is and how my torso and front leg are in complete alignment. There is no "fall back" in this finish. Hold this position for 3 seconds after every shot so you can feel and see the correct positioning. If this had been a full swing, all I would have to do is keep rotating my upper body until the club would be behind me to reach a full finish. If you are a recreational player or beginner, I would spend the first 15 minutes of your practice sessions performing this drill. Then, after you have it perfected, I would cut it down to 5 minutes. Utilizing this drill to warm up before a round of golf or practice session will have you finishing like a pro in no time!